Berries provide traditional mulled cider refreshingly fruity taste. In a large saucepan combine the apple cider or juice, raspberries or strawberries, the 4 inches stick cinnamon, and the cloves. Bring to boiling and reduce heat. Cover and simmer for 10 minutes. Strain through a sieve lined with 100-percent-cotton cheesecloth. To serve, pour the cider into 11 heat-proof glasses or cups. 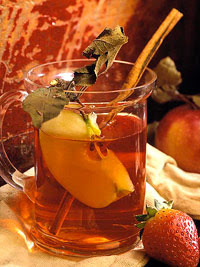 If desired, garnish each serving with a cinnamon stick and apple wedge. Makes 11 (6-ounce) servings. Calories 90, Total Fat 0 g, Saturated Fat 0 g, Cholesterol 0 mg, Sodium 6 mg, Carbohydrate 22 g, Fiber 0 g, Protein 0 g. Daily Values: Vitamin A 0%, Vitamin C 3%, Calcium 1%, Iron 4%. Exchanges: Fruit 1.5. This entry was posted on 2:31 AM and is filed under Drinks . You can follow any responses to this entry through the RSS 2.0 feed. You can leave a response, or trackback from your own site.